Samsung is ugly as hell. I hate rounded shaped things (except women ;) ). Samsung display is one of the most unrealistic displays i have ever seen, this is the main reason i was put-off by the previous SII. On the other hand, LG software is crap and usually ships with even crappier bloat-ware. Support is nonexistent and their responses are an insult to intelligence. Wish there was a Samsung Optimus G :)). LG hardware, display and overall looks with Samsung JellyBean software. While S3 Is ugly looks like a plastic soap . optimus g has way better screen and Display . Anonymous, 31 Oct 2012Only specs are good in lg they will not update the os...ACTUALLY LG OPTIMUS G IS BETTER THAN S3. OPTIMUS G'S VIDEO IS MORE SHARPER , WIDER AND VERY ACCURATE COLOR . Optimus G has better batterylife over 15hours Talk time while s3 has. only 10hours . optimus. g has 45Hours endurance battery life against. s3's 43hours on the same ICS . optimus is currently the most beautiful android phone. samsung galaxy s3 is a plastic and will always remain as plastic phone! LG is a good and will always be good! you will notice that LG Optimus G has more accurate color, and more sharper than s3's photos. LG Optimus G 's video is wider & more accurate in color. the TRUE HD IPS+ IS currently the Best DISPLAY ! Sawsees, 29 Oct 2012Lg -_- Some guys say that Samsung don't make good phones. And they like LG oO ? LG, goo... moreInteresting that you say that about LG considering I've owned numerous TVs and Computer Displays, actually have had my LG LCD TV for over 3 years now and it hasn't missed a beat.. works PERFECT. Same with the monitor I had in the past, 24" LCD.. not a dead pixel or problem with any of my LG devices. This is not to say that their phones are and will be problem free, but I don't think its fair at all to generalize and say all LG product is faulty.. they are every bit as faulty/not faulty as any other company, be-it Apple, Samsung, Nokia..
Stop being a hater.. you sound foolish. Never LG again! My last phone from them (Optimus 3D) was a nightmare: bought it under froyo and although LG promised from the very beginning that it would get updated to gingerbread, they never delivered. I tried OTA, LG update software on PC and it always kept telling me it had already the latest software update which was not true. I finally got it updated by installing third-party software on my PC and even with the official LG-ROM 'forced' installation it was then plagued by the so called 'ghost call' problem , resulting in lost messages and calls.. When I also noticed that it was even not able to connect to wifi without a sim-card inserted, I decided that it was time to switch to something reliable..
Not a fan of Samsung or any other brand, but my SGS3 just works flawlessly, fast and very reliable. My credit also to Samsung for delivering Jelly Bean on time and bug-free. The SGS3 absolutely deserves it's good reputation. Anonymous, 30 Oct 2012LG Optimus "G" IS WAY BETTER THAN S3! IN TERM OF CAMERA/VIDEO? S3'S 8mp is ca... moreYou didn't see the photos and videos? LG lost bigtime, those are bad results. And it can't even take full res photos while recording video. And it has no cardslot, epic fail, it has smaller storage than my phone in 2009. it even have smaller storage than N97 lol. Galaxy S3 is also a loser with its pentile display and moderate battery. Note 2 takes care of those shortcomings. Note 2 is the one to beat and none of these two are fit to fight it. LG Optimus "G" IS WAY BETTER THAN S3! S3'S 8mp is can't be better than of the 13mp VERSION of Optimus "G". IN OTHER REVIEW LG " G" 13 mp CAMERA IS BETTER AND AWESOME! Optimus "G" has better Display over s3! could you imagine when "G" will be updated to jelly beans? 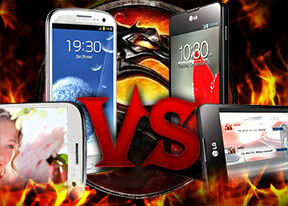 but lg optimus "g' is better than samsung s3! lg optimus "g" is a beautiful , elegant phone! samsung s3 is ugly plastic phone! At&t has the Microsd card in their version of the LG Optimus G, so the SIII doesn't really have an advantage with that carrier. Both really good phones but SIII only does NFC with other SIII's, and the Optimus G is more flexible in that capacity. I also like the screen shot memo you can doodle on the Optimus G features which the reviewer didn't mention. love my galaxy s3. you are all comparing "coming soon" phones to a phone that has been released five months ago.. whew.. now that's a good phone. Oh com'on guys. No matter how great your smartphone is, that greatness will only last for sometime. So dont spend too much.